That show should be renamed "The Mentalists". They're all nutters! And no Simon Baker - luckily for him! They have a show for these people? Reality TV is now officially a freak fest. This program mesmerizes me! And I always straighten up my place after I watch...! 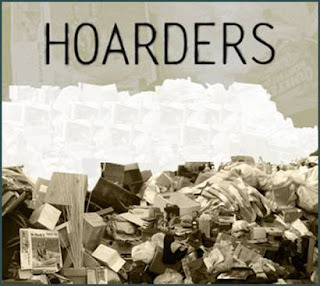 After just finishing helping my grandmother pack the place she's been in for 9 years, I kept conjuring images and feelings from watching Hoarders; (not that it was that bad, but you just know those situations started 'innocently'...). Fascinating, addictive stuff!